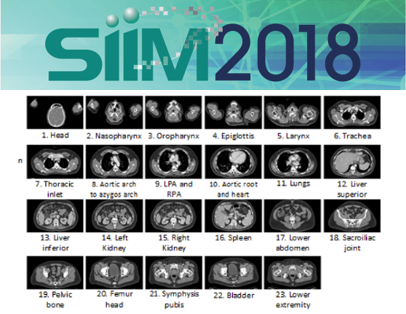 Myeongchan Kim (MD) gave a presentation on his paper “Patient- and Organ-Specific CT Radiation Dose Estimation Using AI-based Body Part Classifier : GrayNet and NCICT” at SIIM 2018 Annual Meeting. Kim, M., Yune, S., Lee, H., Lee, C., Liu, B., Li, X., Do, S., 2018. Patient- and Organ-Specific CT Radiation Dose Estimation Using AI-based BodyPart Classifier: MGH 23 Body-Part and NCICT. In Proceedings of the Society for Imaging Informatics in Medicine Annual Meeting. Currently used solutions to measure organ specific radiation exposure during a computed tomography (CT) scan estimate radiation dose based on the predefined scan range by CT scan region. However, to reflect diverse body types, patient-specific slab selection is essential to develop precise organ dose estimation. We developed GrayNet, which is an automatic classifier for CT images that classifies body parts into 23 categories by using a deep convolutional neural network (CNN)Patient-specific radiation dose estimation method was investigated by combining GrayNet and ICRP-110 referenced National Cancer Institute dosimetry system for computed tomography (NCICT). Flow of GrayNet and NCICT. (a) GrayNet classifier. (b) Range selection on coronal view on CT and post-processing with regression. Each color of horizontal line indicates predicted anatomical class. (c) Selection of slab range on NCICT phantom.